The following report is extensive and, due to its nature, ongoing. It’s that way because the topic being investigated is extremely convoluted and contentious and, for the most part, clandestine when it comes to seeking and receiving reliable, truthful answers to questions that concerned individuals and groups have been asking politicians and governments for close to two decades. 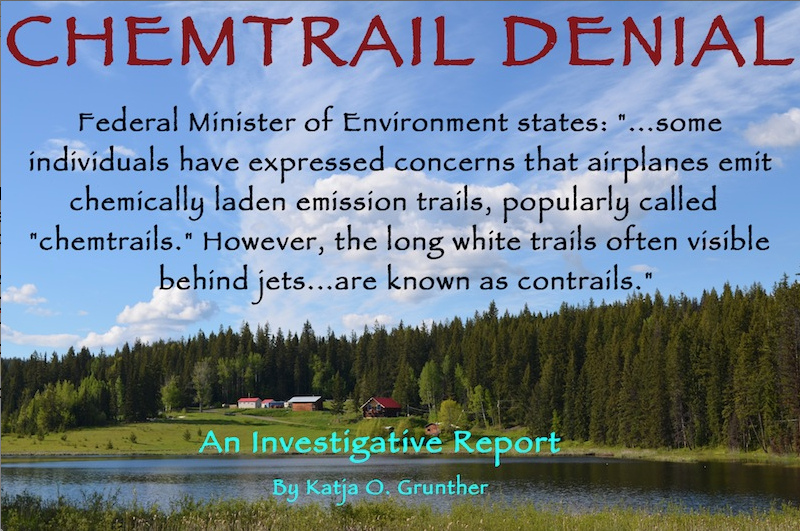 Amongst those who have been investigating the controversial phenomenon now commonly known as “Chemtrails” is a lady named Katja Oljuscha Grunther who lives in New Denver, British Columbia, located in the southern Kootenay region of the province. 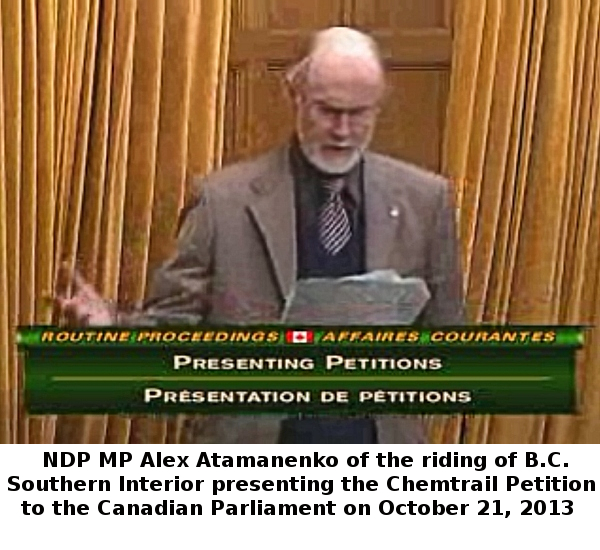 Although a relative newcomer in terms of her work and efforts in trying to obtain reasonable answers to her questions regarding the ongoing spraying of chemicals, her concerted efforts in this regard (on top of challenging personal health issues) eventually bore fruit when she was able to gain the ear of her federal Member of Parliament Mr. Alex Atamanenko, who, upon studying the documentation that she provided to his office, consented to bringing her concerns before the Canadian parliament in the fall of 2013. By accident, during Katja Grunther’s researching, she came across my website British Columbia Chemtrail Alert and upon perusing it contacted me with an invitation to participate in the process; an offer which I happily agreed to. Katja Grunther, back in the fall of 2012, had taken rainwater samples immediately after observing heavy spraying in her area. She then sent these samples off to a laboratory in Courtney, B.C. (North Island Laboratories) to have them tested. Not surprisingly (to me at least), the results showed high levels of aluminum, cadmium, strontium, lead, and tin. When her friends and associates became aware of the results they encouraged Katja to contact her MP which she then did, furnishing him with an abundance of information related to the whole issue of chemtrail spraying or what is also referred to as “geoengineering” by the more conservative segments of the scientific community. As Katja put it, “wonder of wonders” she actually heard back from Atamanenko who didn’t attempt to immediately brush her off as a wacko or a “conspiracy theorist” unlike so many other governmental agencies and politicians are wont to do whenever questioned about this taboo topic but instead consented to forward her concerns to then Minister of Health Leona Aglukkaq as well as Minister of Environment Peter Kent, asking them to look into the matter on her behalf. 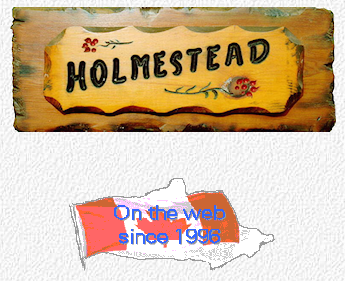 Concurrent with Katja’s valiant efforts was another initiative set in motion by Brian Holmes from Ontario who has been running a website called Holmestead.ca since 1996. Brian had created what was called The Canadian Chemtrail Petition for 2013 which, from the period of January 2013 until May 15, 2013, had collected close to 3,500 signatures from petitioners across Canada who had signed hard copy petitions. MP Alex Atamanenko had indicated that he would be willing to present the Petition to Parliament on behalf of his constituents and, lo and behold, he did on October 21, 2013. To read the Hansard record and view the short (less than one minute) video of Mr. Atamanenko making the presentation CLICK HERE. In the interim time period from when MP Atamanenko had sent Katja Grunther’s information package to Minister of Health Leona Aglukkaq as well as Minister of Environment Peter Kent a cabinet shuffle had occurred and now former Health minister Leona Aglukkaq was in the position of Minister of Environment. It was from Aglukkaq that Katja eventually received a formal reply to her many queries regarding this contentious issue. What appears below is first Grunther’s initial cover letter sent to her MP, Alex Atamanenko containing a plethora of details regarding all of her research followed by the reply letter which she received from Leona Aglukkaq, Minister of Environment dated November 14, 2013. Following the minister’s reply is Katja Grunther’s latest response of December 2, 2013 to the Environment Minister’s rather pithy (and in my mind, all too stereotypical) response to the critical concerns of so many Canadians. Due to the length of the post I have added hyperlinks to the various added pdf files which Katja refences throughout her letters to government officials. It is hoped that readers will be inspired by the efforts of Katja Grunther and moved to pass this article on to others in the ongoing process of awakening more and more Canadians to the reality of what is occurring in our skies on a daily basis. As well it would be great if readers were stirred enough by this report to write to the federal Minister of Environment, Leona Aglukkaq and express their concerns. TO THE GREATER GLORY OF GOD!